Datasheet for the ECH-41 triode-hexode vacuum tube. These 1930s vintage multi-component vacuum tubes were actually the first examples of integrated circuits insofar as they incorporated two or more different types of amplifiers, or amplifiers and diodes. Just as with semiconductor integrated circuits, isolation between elements was a concern and necessitated additional screen grids for that purpose. The triode hexode was developed specifically to solve the issue of degenerative feedback squelching intended oscillations in the newfangled higher frequency shortwave radio sets that were all the rage back in the day. 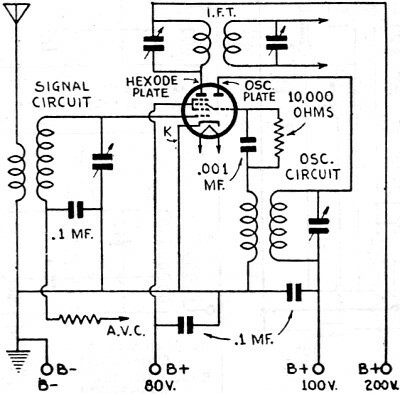 It combined a triode for the oscillator circuit and the hexode was the 'frequency changer,' aka mixer or downconverter. Until recently, designers of short-wave equipment have had to utilize tubes which were made for use on lower frequencies and make the best of a bad situation. The demand for better parts - and especially tubes - has brought several new tubes, such as the RCA "Acorn" tube into existence. When the pentagrid-converter tube was first introduced, set builders hailed it as the answer to all problems of superheterodyne construction. Here was a tube which answered all the problems without introducing any new ones. 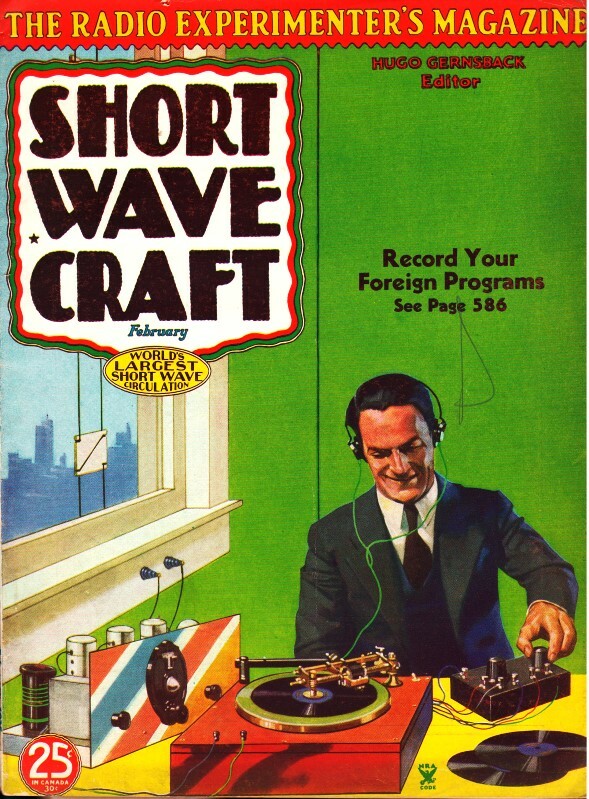 But like all other "cure-alls" the pentagrid tube also has its faults - among which is a tendency to stop oscillating at high frequencies, above a certain critical frequency - which limits its use in short-wave sets. This is caused by a feed-back of energy from the oscillator plate (grid) to the control-grid, through the inter-electrode capacity, for the shielding between these electrodes is necessarily imperfect. This feed-back causes a degenerative effect which reduces the over-all gain of the tube and on high frequencies, where the impedance of the inter-electrode capacity is low, it actually stops the oscillator from functioning. In order to overcome these disadvantages, a new electron-coupled frequency converter or translator as it is sometimes called, has been designed in England. This new tube was described in Wireless World. Hook-up for the new English "Triode-Hexode" tube. It consists of two separate tubes built into a single envelope - one a triode and the other a hexode - hence the name. The hexode has six electrodes, a cathode, a control-grid, two screen-grids, a coupling-grid and a plate. The control-grid immediately surrounds the cathode and is itself surrounded by the first screen-grid. The coupling-grid comes next and is separated from the plate by the second screen-grid. The coupling-grid is connected internally to the triode (oscillator) grid. This grid is surrounded by the triode plate, and the latter two elements form an entirely separate tube, joined with the hexode only by the coupling-grid which provides the desired electron coupling. Variations in the oscillator plate voltage have no effect upon the screen and plate currents of the hexode, and changes in the hexode screen, plate, or control-grid voltages do not alter the oscillator plate current. 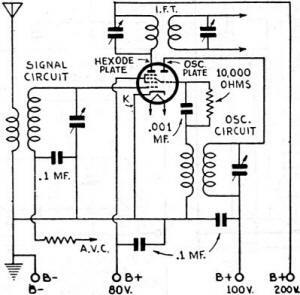 It will thus be seen that the triode-hexode offers important advantages over other frequency changers in that, while it is non-radiating and can be controlled from the A.V.C., it gives complete freedom from interaction between the signal and oscillator circuits and also a lower level of background hiss. These points are important in broadcast reception, but they are doubly so on short wave lengths.